Breakfast foods are by far a favorite in our home, so I’m always trying to add a new twist to some of our traditional recipes. You would not believe the amount of pancakes that my kiddos can inhale. I love my Electric Griddle , and use it weekly, but when the gang, plus friends, are in the house for pancake flipping mornings, I need something commercial size. That’s why when I’m feeling a bit lazy, I go with a puff pancake recipe that I can just put in the oven. Admittedly, it’s not quite the same. There’s nothing like a mile high stack of golden brown pancakes drizzled with buttery syrup, so this morning, I willingly obliged. By adding a few things I already had on hand, the result was something really special. Just this little hint of orange and the added creaminess of the yogurt makes for a delightful pairing to your basic pancake recipe. When you use plain yogurt, you’ll get the added natural sweetness from the orange juice (and the addition of syrup), so if you want it a tad sweeter, I use vanilla. This serves four, so make sure you double or triple the batter if you’d like some extras for later. 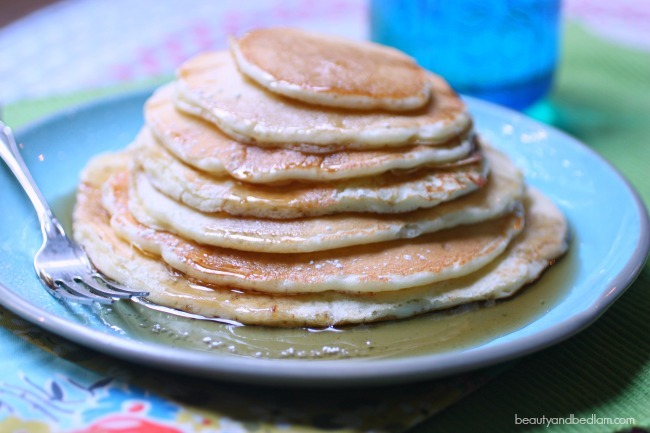 What are some of your favorite pancakes? 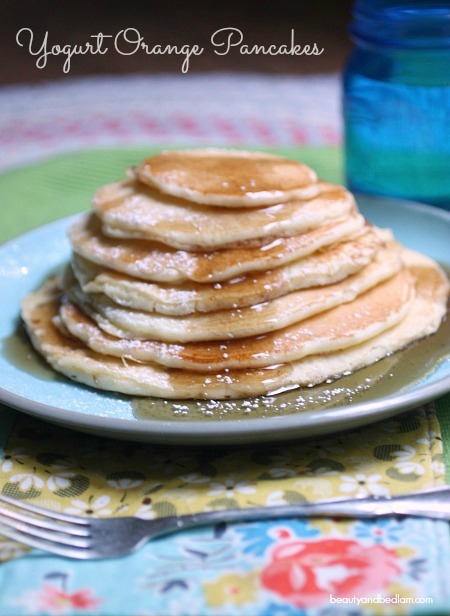 Enjoy browsing more of my pancake recipes here. Summary: With a little addition of yogurt and orange, we find ourselves with some unbelievably delicious Yogurt Orange Pancakes. Combine the rind, OJ, yogurt, egg, sugar and melted butter. In separate bowl, sift flour, baking soda, baking powder and salt together. Add to yogurt mixture and stir to combine. Brush butter on griddle and heat griddle to moderately high heat. Spoon batter on griddle to form 3 – 4 inch round pancakes. Cook for 1-2 minutes or until tops begin to bubble, flip and cook until golden brown. Garnish as desired. Sliced strawberries on top of a dollop of yogurt or whipped cream is delicious.